The photo below was taken INSIDE the Auschwitz-Birkenau camp, but it is supposed to show what the tracks going into the camp looked like. My photo below shows what the tracks going into the camp really look like. 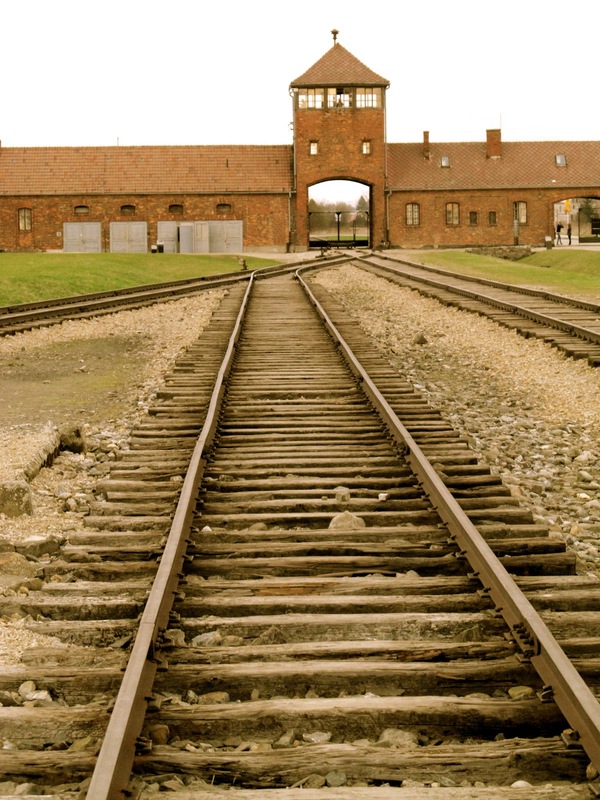 Tracks outside the Birkenau gatehouse. Konzentrationslager Auschwitz, the main camp, was originally opened on June 14, 1940, as just another concentration camp, in the former Polish military garrison in Zazole, a district of the town of Auschwitz. Thirty German criminals, who were prisoners in the Sachsenhausen concentration camp, were brought to Auschwitz in May 1940 to convert the garrison into a prison camp. Throughout its existence, the Nazis called Auschwitz a concentration camp, not an extermination camp or Vernichtungslager. The term “extermination camp” was coined by the Allies and initially, it applied to all the Nazi camps. During World War II, America had “internment” camps for German-Americans and Japanese-Americans. The prisoners, who were kept in these camps, were not sent to other locations to work. If there had been a network of work camps in America, prisoners would have been first sent to North Platte, Nebraska, which had the world’s largest railroad yard for train connections. The size of the Bailey train yard at North Platte was 2,850 acres. Compared to North Platte, the Auschwitz train yard was tiny, but it was still the largest train yard in Europe. The Auschwitz main camp originally had 20 brick barracks buildings; 14 of them were single story buildings and 6 were two stories high. When this camp was converted into the Auschwitz concentration camp, a second story was added to the 14 single story buildings and 8 new two-story buildings were added, making a total of 28 barracks buildings. Between 13,000 and 16,000 concentration camp prisoners were crowded into these 28 buildings where they slept in three-tiered bunks. At one point, in 1942, there were 20,000 prisoners at the Auschwitz main camp. The city of Krakow, located 37 miles from Auschwitz, became the capital of German-occupied Poland, known as the General Government. It is important to note that, during the time that Auschwitz was a killing center, it was in the Greater German Reich, not in occupied Poland. 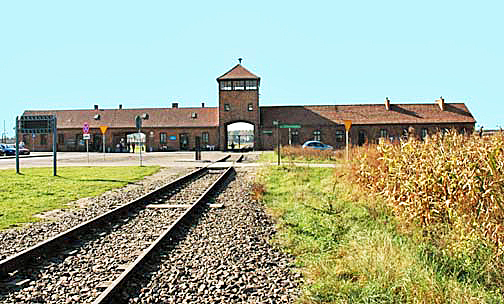 The Polish people are incensed when Auschwitz is described as a concentration camp in Poland. Auschwitz was located literally at the junction of the Greater German Reich and occupied Poland; it was also in the heart of “The Black Triangle,” an industrial area with large coal deposits, which is why it was such an important location for the Nazis.